WILLOUGHBY, OHIO, UNITED STATES, December 6, 2018 /EINPresswire.com/ -- Milestone Auctions’ Winter Spectacular is always the Ohio-based company’s most eclectic sale of the year. Typically, it contains rare and exceptional items that have been reserved over the preceding 12 months to feature in the company’s big end-of-year event. This year’s 693-lot Winter Spectacular, to be held December 8 at Milestone’s suburban Cleveland gallery, is brimming with fine and decorative art; magic, circus, movie and travel posters; political and historical Americana; toys and Christmas antiques; and 20 lots of coins, from individual rarities to US Mint and proof sets. “Because it is so varied, our Winter Spectacular attracts many types of collectors. We make an extra effort to source ‘hidden treasures’ to include in every category, because more than anything, collectors love a new discovery,” said Chris Sammet, co-owner of Milestone Auctions. The Milestone team travels far and wide to visit and assess estates and collections, a method that brings many exciting new finds to the marketplace. 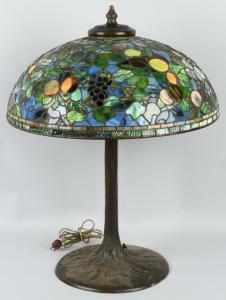 On auction day the gallery will be aglow with the beauty of art-glass lamps by Tiffany Studios and other premier makers of the Art Nouveau through Art Deco periods. Tiffany offerings are led by a table lamp with a stunning 24½-inch leaded-glass shade in the ‘Fruit’ pattern, double-marked and estimated at $20,000-$30,000. A most unusual double-marked Tiffany table lamp in the ‘Lotus’ pattern has a 22-inch shade whose shape resembles an inverted blossom, narrower at the top and fanned out around the bottom. It is estimated at $20,000-$25,000. Yet another Tiffany highlight is a double-marked ‘Poinsettia’ leaded-glass lamp with 20-inch shade. Estimate: $10,000-$20,000. The selection also includes lamps, bases and hardware by Duffner & Kimberly, Handel, Bradley & Hubbard, Pairpoint and others. European and American art in a variety of genres includes such highlights as a Robert Watson (British, 1877-1920) oil painting titled Highland Cattle, Western art, marine depictions, landscapes and genre paintings. Several works are already attracting strong pre-sale interest: Guy Carleton Wiggins’ quintessential New York snow scene titled 5th & 26th St, an Edward Potthast (American, 1857-1927) oil-on-board titled Beach Scene, and a Johann Berthelsen (Danish/American, 1883-1969) watercolor scene of the Brooklyn Bridge. Each of these three important works is artist-signed. Two rare and very special lots qualify as both automotive art and Americana. Each is a large-size, highly detailed model of an automobile created by engineers at an early 20th-century automobile factory. A 1932 Hudson ¼-scale factory-made model of a 4-door sedan measures 45 inches in length. It is one of only 12 examples (in six body styles) that were ever made at the Hudson plant, all for display at the 1932 New York Auto Show. Additionally, a 1919 Cadillac Type 57 Limousine, factory made in 1/8-scale, is 25 inches long and was created specifically to display at the 1919 New York Auto Show. 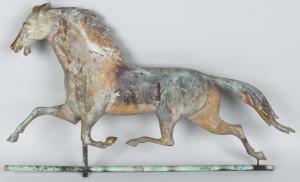 Each of these extraordinary models is expected to make $30,000-$40,000 at auction. Other categories include Charles Lindbergh memorabilia, walking canes, silver, clocks and watches; amusement games and trade stimulators; pottery, porcelain and glass; beer steins, travel agency signs and airplane models; and more than 100 lots of vintage glass Christmas ornaments.